Occasionally we like to highlight humourous videos that riff on Nintendo history, particularly as it shows — above all else — that Nintendo is a strong part of pop culture. If people keep referencing Nintendo's games and systems, particularly of the retro variety, it all helps to keep the company's brand at the forefront. Also, it can be a lot of fun. 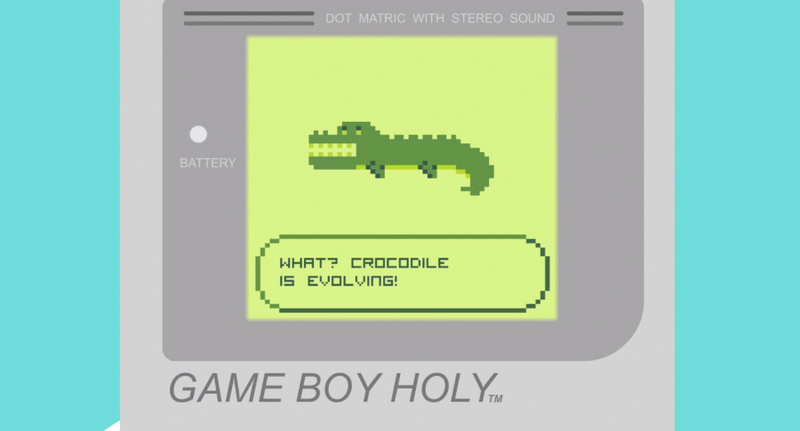 The video below is less than a minute long and jokingly answers a question of evolution with a fictional Game Boy and Pokémon game. Before the video though, everyone should pay attention to the creator's explanatory note below. ...I think some of you have misunderstood a key element of this cartoon, probably my fault, I thought most societies these days were clued in on Evolution but clearly some are not (a lot of Americans seem to be making this mistake). I do know Crocodiles evolved from another creature (the Phytosaurs) and I know they have evolved in the 225 million years they've been around to some level or another. This cartoon is a joke, it's a bit of light humour that ignores science for a bit of fun, like Spongebob or Dexter's Lab would. I am not trying to preach that Evolution doesn't make sense, it does! I am not saying this is genuinely what I believe, if I seriously wondered this question I wouldn't make an animation, I'd go on Yahoo Asks like a normal person! So come on, try to understand this is just a light hearted joke and don't get too upset that it isn't hard fact. With that said, check it out below and let us know what you think; please chat about the video specifically and maintain context, as the creator requests. For our money, this is a fun little video. Pokemon - confusing evolution with metamorphosis since 1996. Personally I thought this Charles Darwin comic was a far funnier approach to the pokémon evolution philosophy. The fact that you cannot find the fossils of every single Pokemon in Mt Moon proves that the theory of evolution is false. It saddens me that he felt the need to explain the video. Surely people aren't that dense? In before someone gets offended by this, despite the explanation. I always wondered why in Pokemon its "evolving" when it's much closer to metamorphosis. That video exceeded my attention span by 58 seconds. @Happy_Mask Trick?....you mean the controls for playing the game...? Kinda presumptuous for this video creator to call out a nation of 315 million ppl. Painting them with a broad stroke as simple and "not as smart as you are. They believe in creationism, and the author doesn't." Meanwhile, surely (educated guess) at least 50% of the people who've opened the link are American. It's on Kotaku.com, yeah an American site. My guess is the Western game titles the author likes aren't all European. But when it suits him, Americans are religious bumpkins. I've been dealing with (sometimes irrational) foreign hate my whole life, and my problem with it is: have the courage to stand by your convictions. Can't bite the hand that feeds you and keep gourging out of his palm. Or maybe you can, because I see vitriol like this all the time on the net and Americans keep coming back. I guess they are just more forgiving than I. Hilarious! That's why the crocodile will never evolve. @Wheels2050 Welcome to the world.
" If people keep referencing Nintendo's games and systems, particularly of the retro variety, it all helps to keep the company's brand at the forefront." @taps Hey there, sorry if I came across as referring to Americans in this way to you, it seirously wasn't what I meant. Actually the Americans I was referring too are vocal Athists who seem convinced that fellow Americans would be stupid enough to take my cartoon as an argument for creationism. I don't agree one bit, even people who subscribe to an idea like creationism are fully able to see the difference between a silly joke and a fair augment. Alas I was getting a lot of negative feed back, some down right abusive so I felt I needed to defend myself. A lot of european people didn't seem to understand my need to defend myself so I included the mention that it was mostly Americans who'd been annoyed because simply it was. Not because of their stereotype or anything like that, but simply because the vast majority were American. Once again, I do apologise if my comment came across in the wrong way, it was far from my intention and I hope I didn't offend. @Timbojay hey this is coming 5 years later I just dropped a rant and ran. Thanks for taking the time to explain yourself and I admit I reacted poorly and misread your comment. @taps oh wow, I forgot Nintendo Life even featured this old animation XD No problem my friend Merry Christmas!